If you’ve seen Mary Poppins Returns, you’ll probably remember the scene where cinema’s favourite nanny and cleaner magically tidies the children’s bedroom with nothing more than a wave of her delicate hand. As books and papers instantly swarm into a neat pile, it’s hard to resist wishing that keeping on top of things in our own homes could be so easy. But in the end, magic only exists in fairytales. Even the greatest illusionists, like Dynamo or Penn & Teller are only making you think they’re using some sort of special power. Magic isn’t real, and the closest you can get to it when it comes to cleaning your home is to use nature to do the hard work for you. But even though you know magic isn’t real, and I know magic isn’t real, there are still people out there who expect miracles from their cleaners and who become completely unreasonable when that person can’t deliver the Earth. I’ve been running my business for many years now and whilst the vast majority of FastKlean’s clients are truly wonderful people who treat the cleaners we send to them with enormous respect and consideration, I’m still surprised occasionally by how uncaring the occasional person can be. London is cleaned every day by an army of cleaners who are either employed by companies like ours or who are self-employed, securing work through personal recommendations or local advertising. Most of the cleaners who get by in life by making other people’s homes look beautiful work extremely hard and for wages that are at the lower end of the scale. They’re often up before the sun – or, if they clean commercial premises – work late into the evenings to accommodate the needs of their clients, and they tend to work long days to make ends meet. So, it’s always very distressing when I hear that the people whose homes and offices they transform on a daily or weekly basis don’t repay that hard work with a little empathy and respect. There are several ways cleaners can be taken advantage of – and we’d like to raise awareness to try to inspire people who are sometimes guilty of having unreasonable expectations of their cleaner to try changing their ways. Just as you or I might go out of our way to help someone out, your cleaner will probably also be prepared to occasionally go the extra mile as a special favour. But it’s a different matter when the request isn’t really a request at all, but an instruction. I doubt any of us would want to do extra unpaid work on a regular basis – especially if we thought we couldn’t say no, yet that is what many cleaners are often asked to do. And because they don’t want to lose a job they can’t afford to be without, many feel pressurised into agreeing. In the end, there’s nothing wrong with asking, very occasionally, if your cleaner wouldn’t mind doing an additional little job or task – as long as the person asking makes it clear they have a genuine choice in the matter and expects to pay extra for the work. In your job, if you know that you can only get five things done in a seven -hour day, then you’re probably not going to be best pleased if your boss asks you to complete six tasks in the same amount of time. If you want to get occasional additional jobs done, then the best way to do might be to alternate or rotate less important tasks across several weeks, so three or four jobs get done once or twice a month rather than every week. And if it’s a task that needs doing during every clean, then it may be the only solution is to increase the time your cleaner is with you each week and pay accordingly. That keeps it simple and fair for everyone. Having a cleaner is wonderful because it allows us to get on with the things we actively enjoy doing. But that doesn’t mean it’s fair to create more work than they can reasonably expect to complete. Many people tell me they actually do a bit of cleaning before their cleaner arrives! But there are people who seem to do the opposite and leave the sort of mess that wouldn’t be regarded as being ‘normal’ for their home – and they then get cross when the cleaner doesn’t have the time to clean to their normal high standard. 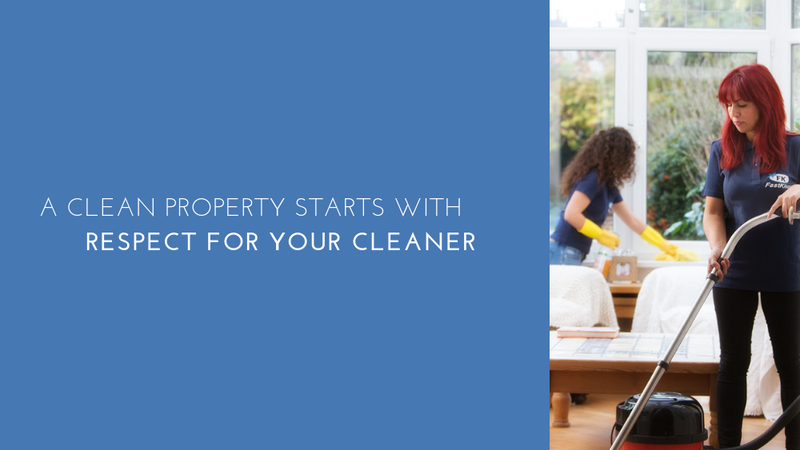 We don’t expect you to clean your house before our cleaners arrive – but it’s always a good idea to get rid of extra mess so your cleaner can do the best possible job for you. After all, that’s in everyone’s interests! When we start our careers, or move to a new company, it can take a while to learn how the company works, where everything is kept, how the boss likes you to work. The smallest things – like the location of the loos and the stationery cupboard, are all things that need to be learned. It’s no different for your cleaner. When they arrive in your home for the first time, it doesn’t matter how experienced they are – they still have a huge amount to learn: where you keep your cleaning products, what techniques work best for the surfaces in your home, a routine that keeps you out of each other’s way so you can both get on with what needs to be done, etc. Just as we wouldn’t be expected to learn and remember everything on the first day of a new job, so we shouldn’t expect our cleaners to have to do that. As humans we should aspire to respect each other and treat one another with the sort of kindness and understanding we’d expect to receive ourselves – and that includes the people who come into our homes to provide a service. So, if you’re reading this and you use the services of a cleaning company or a private cleaner, we’re encouraging you to think about whether you can support the person who cleans your house to do the best possible job. Because if you can, you both win. If you like this blog, please share it with your family and friends. Thank you!